The cushaw squash is not one that is readily found in the grocery store, but one pass through your local farmer’s market or pumpkin patch and you will likely see one. They are hard to miss with their vibrant green stripes and large size. Because of it’s size, I resisted buying one for quite some time because I was intimidated by the thought of trying to use it all! When I finally worked up the courage to go for it, I was pleasantly surprised. I bought it at a local pumpkin patch for just $4.00 and I was determined to use every last bit of it. 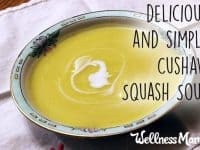 As it happens, this squash is extremely versatile and with the help of my little taste testers, we had no trouble finding several delicious ways to use it! 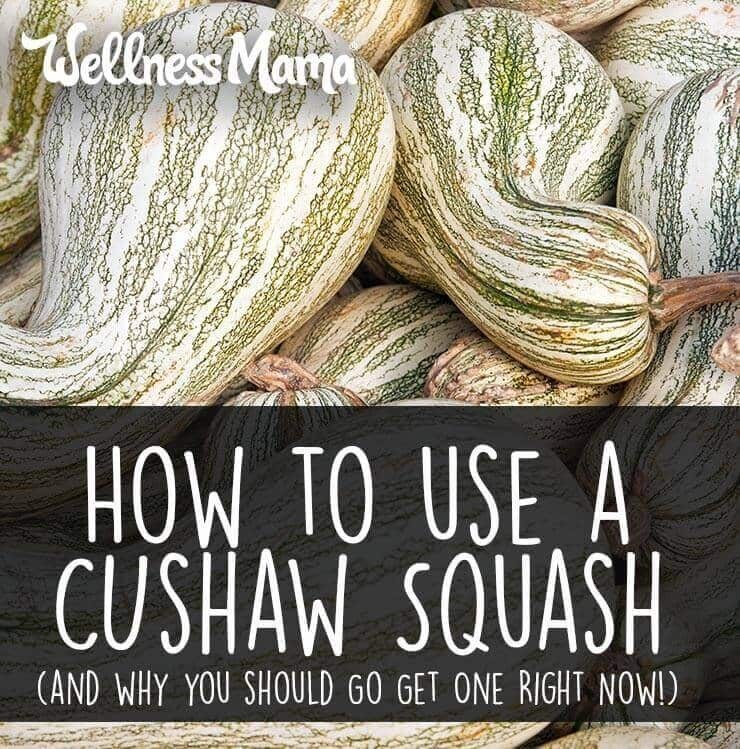 The cushaw is a variety of winter squash and is originally from the south of Mexico. It is a large (sometimes up to 20 pounds!) 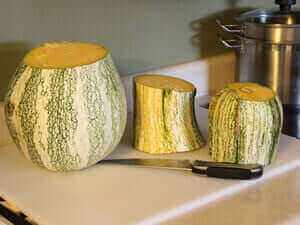 squash with a characteristic green and white striped pattern. It has a mildly sweet taste and behaves like a pumpkin or delicata squash when it is cooked. It is high in vitamins C and A which make it excellent for your immune system. After its wonderful flavor and affordable price, my favorite thing about this squash is that it is resistant to the squash vine borer which has wreaked havoc on my own squash plants on more than one occasion. This makes it easy to grow your own and because it preserves so well, you can enjoy cushaw all year long. So let’s recap: the cushaw squash is easy to grow, resistant to pests, easy to store, versatile to cook with, good for you, inexpensive, and yummy! What are you waiting for? Let’s get started! I have talked before about freezing a cushaw in cube sized pieces in order to keep it for later use, but there are many other ways to use and prepare this type of squash. I began by washing the dirt off of the skin and cutting off the stem. I then sectioned it into 3 large pieces by cutting the neck into two sections, leaving the large bulb shaped bottom for last. I joked that I would need a hack saw to get through it, but it was actually no more difficult to cut through than a large pumpkin. The top section of the neck I sliced in half the long way. I peeled the skin off the first half with a vegetable peeler and cut it into 1” cubes. The other half I sliced it into 1” wedges. I did not peel the skin off because I didn’t feel it was necessary. The wedges and cubes would be used to make a simple roasted side dish. Moving on to the middle section, I again peeled it with the vegetable peeler and began cutting it into 1” cubes until I had 2 pounds (or 10 cups). These would be for squash soup. The rest I cut into ½” cubes and divided this pile in half. I allotted about 4 cups to make a sweet dish and the other 4 cups to be saved for a delicious side. Now for the bottom piece. I cut it in half and scooped out the seeds. Save them! They make a wonderful roasted snack. Don’t worry about peeling this part. I cut it into large hunks and put it in a steamer basket. I was (barely) able to fit it all into the steamer basket in my large stockpot. I added about 3 inches of water to the pot and steamed for about 20 minutes, then tested it after 20 minutes by poking it with a fork in several places to make sure it was all tender. Once it was done, I pulled it out one piece at a time and, using a knife, cut away the skin. It came off very easily. Then, I put all the flesh back into my stockpot (removed the water first) and pureed it with an immersion blender. You can also use a food processor or high powered blender for this part, but immersion blenders make the job so easy! This is where this squash really made me happy. Once it is pureed, you can literally do anything with it! 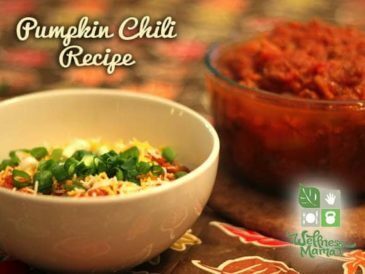 It can be used as a substitute for pumpkin puree to make muffins, pie, cheesecake, lattes, pancakes, and chili just to name a few. I made smoothies and then froze the rest in 1 or 2 cup quantities to use later. Perhaps the easiest way to use a cushaw squash (or any winter squash really) is to simply roast it in the oven. Any desired spices can be used and you can customize this however you’d like. I often make big batches of roasted squashes and other vegetables on the weekend and have in the fridge to add to soups, casseroles, or other meals on busy nights. In a large bowl, toss cushaw cubes with olive oil, rosemary, and sea salt. Cook in 400°F oven for 15 minutes. Stir and cook for 10 minutes more. To make roasted slices instead of cubes:Brush or spray with olive oil. Lay flat on a baking sheet. Sprinkle with sea salt and rosemary. Bake for 25 minutes, flipping halfway through. The natural sweet taste of cushaw lends itself perfectly to a sweet and savory soup. Naturally gluten free and dairy optional, this soup is delicious on its own. For a full meal, consider adding some pre-cooked chicken or sausage for protein. Cushaw’s sweet taste and firm texture make it similar to apples when seasoned with honey and cinnamon. For a healthy and delicious dessert in just a few minutes, saute some cushaw cubes in a large skillet with some butter, honey, coconut milk, and pumpkin pie spice to create a taste similar to baked apples. Feeling like an overachiever? 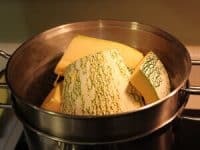 A cushaw can literally be dinner (as a soup) and dessert (like this recipe) in the same day with several pounds left over to freeze for another meal, considering you can usually get one of these for under $5.00, that is an amazing deal! View the recipe here. Lemon pepper makes everything better … at least in my opinion. I started making my own lemon pepper seasoning years ago and I add it to everything along with some garlic powder and salt. I’m convinced that practically any spice would pair well with winter squash because of the mild flavor (curry powder anyone? 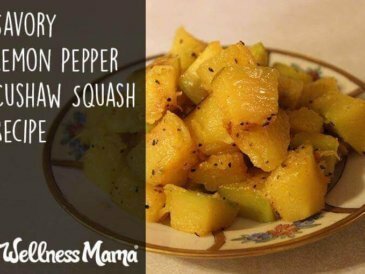 ), but I really love this savory lemon-pepper flavored cushaw squash recipe. Check out the recipe here. Not sure about the idea of putting squash in a smoothie? 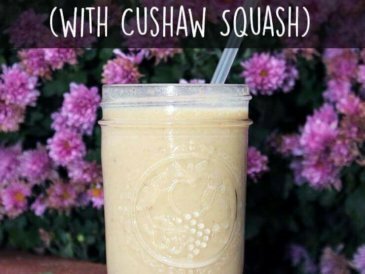 Since cushaw squash makes a great substitute for pumpkin in recipes, it is perfect in a pumpkin pie smoothie. It is slightly more sweet than pumpkin and naturally high in vitamins. It pairs well with pumpkin pie spice, coconut milk, banana, yogurt, and honey in this recipe. 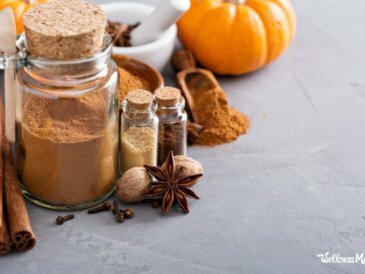 Here’s my cushaw pumpkin pie spice smoothie recipe. And if you didn’t get enough out of your squash already, you can toast the seeds for a tasty, crunchy snack. Seasoning them is a matter of preference. 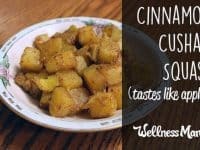 You could sprinkle them with cinnamon and a drizzle of honey for a sweeter snack or use any combination of your favorite spices. Just don’t forget to save a few and dry them to grow next year, they are easier to grow than pumpkins and can substitute for most winter squash. You can probably grow a big crop with just a few seeds in a small area of your backyard. 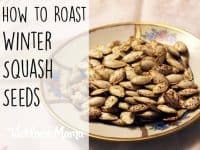 Check out how to roast cushaw seeds here. Have you ever cooked with cushaw squash? Let me know your favorite way to prepare it below!